Since last year Diwali day i.e. 19th Oct 2017, Sensex and Nifty have given returns of 7.2% and 3.1% respectively, however broader markets have underperformed, BSE Mid Cap and Small Cap Index have given negative returns of -7.4% and -15.3% respectively during the same period. The probability of the stock market giving double digit returns in Samvat 2075 is high considering significant correction in broader markets during this year. Back to the present scenario, the road ahead seems promising. However, the global events are likely to dictate the trend in the near future. The future looks bright for Indian equities as economy is on the cusp of turn-around with recent drop in crude oil prices, inflation under control, stable rupee and expectation of earnings catching up with valuation. Investors with the horizon of 12 months can utilise ongoing correction to invest in Indian equities. We are pleased to inform you that we have selected 10 scrips from universe of large, mid and small cap stocks which can benefit investors during next 1 year. We are confident that these carefully selected stocks can outperform major indices like Sensex and Nifty during next 12 months. 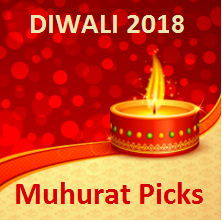 We have released Diwali Muhurat Portfolio 2018 of 10 stocks on 07th Nov'18 and shared with all our paid subscribers of Hidden Gems, Value Picks & Wealth-Builder under Dussehra - Diwali Offer of the Year (closes on 15th Nov'18). To know about the offer, click here. If you wish to receive our Rs. 1 Lakh Diwali Muhurat Portfolio - 2018 of 10 Stocks, you can subscribe to our services under Dussehra - Diwali Offer of the Year. Our stocks selection process includes lot of research and data analysis. We first identified the sectors that are likely to do well in next 12 months. Having that done, we further refine our search to select companies from that sector. We create a portfolio worth Rs. 1 Lakh comprising 10 stocks so that it can help investors to create a model portfolio with lump sum investment up to 1 Lakh. We have given the different allocation to each of the scrips keeping in mind the risk versus returns ratio. We have also fine tuned the portfolio with large cap, mid-cap and small cap scrips from different sectors so that the investors can invest in a complete mix of stocks to balance their portfolio. Saral Gyan Diwali Muhurat Portfolio of 10 Stocks for 2018 also include best of Hidden Gems and Value Picks recommended by our equity analyst’s team during last couple of years. Multi-bagger stocks are created because they are able to scale the opportunity rapidly. Titan Industries is a great example. In 2003-04, Titan‘s market cap was 500 crores. In 2018, it is close to 77,000 crores. The fact that India is a booming marketplace of 130 crores consumers means that most products and services have a head start at trying to scale up their activities. 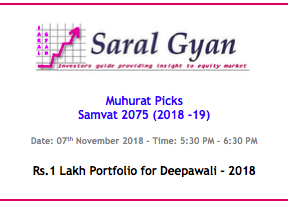 Saral Gyan Diwali Muhurat Portfolio of 10 Stocks has been shared with all our Hidden Gems, Value Picks and Wealth-Builder members on 07th Nov'18. Portfolio stocks holding period is minimum of one year, same will be evaluated by our analysts next year before Diwali festival.